The Config. 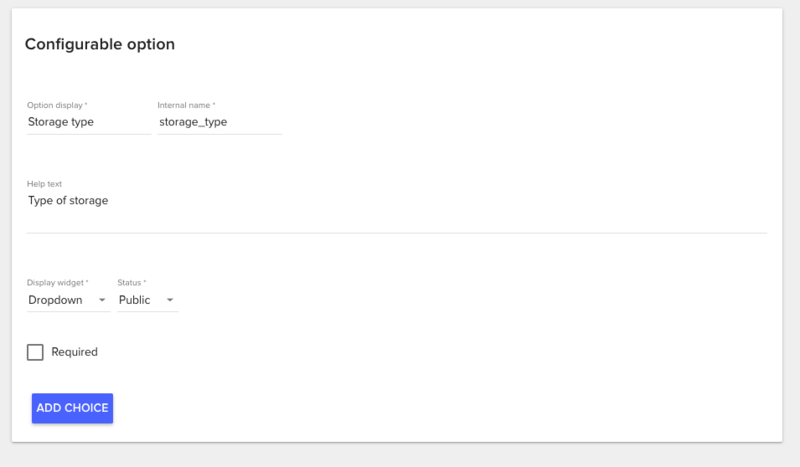 options page lists all configurable options available, that can be associated with products. An option can also be marked as Required forcing a client to specify a value for that option when asked. For Quantity input types, there are also additional validation fields that allow setting of a minimum, maximum and step size for the quantity. 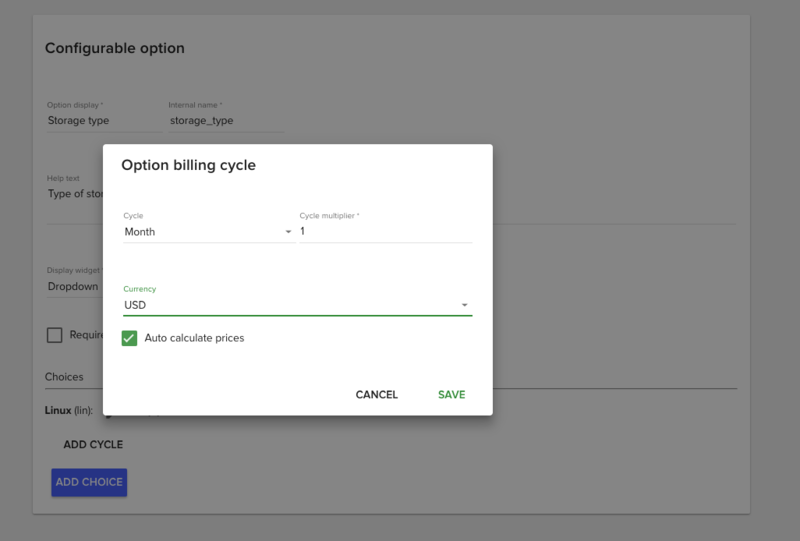 A billing cycle for a configurable option determines the way the option is billed based on it’s value. Cycle multiplier: enter a number. For example selecting Month and entering 3 as multiplier means every 3 months. Currency: select the currency the prices will be expressed in. Do note that options only appear for products that have the prices in the same currencies. Setup fee: cost of setup if required. Leave zero for no cost. For Dropdown and Radio, choices will need to be defined and each choice will need to have billing cycles defined. Each choice has a Label and a Value. The label has display purposes only and will appear on invoices and shopping cart while the value is used for billing and setup. Once a choice is added, billing cycles can be created and prices defined for that choice. Select one of the available options and click the associate button. 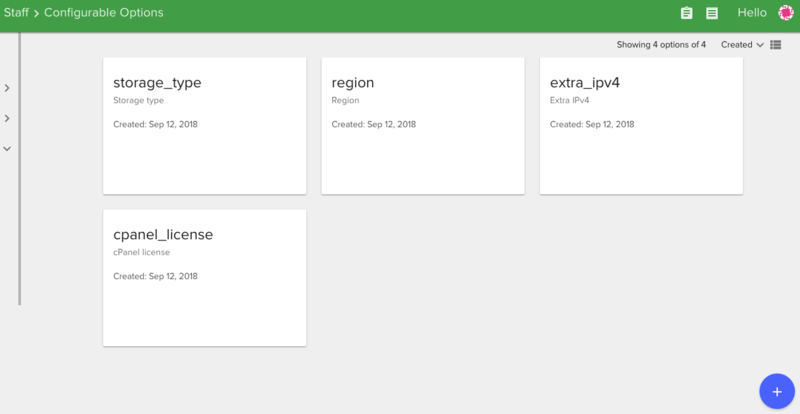 Please note the Product cycles match column that indicates whether all the product billing cycles are also available for the configurable option. 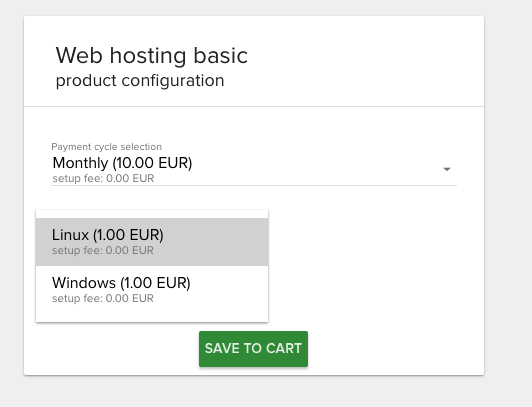 Not having all the billing cycles matched may not allow this option to be selected all the time by a client when ordering the product.